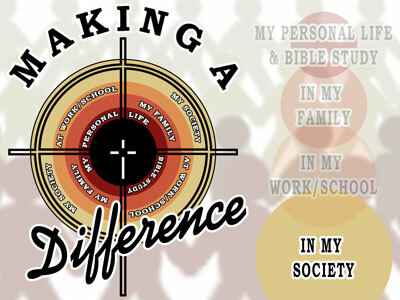 Our Summer Series of sermons will focus on “Making a Difference” in various circles of our life. Working from the inner most circle of our personal life and as the circles widen to our family, our work/school, and finally to our society. Through all of these series we will be modeling our life after being like Jesus. To be formed into the image of Jesus (Rom. 8:29; 2 Cor. 3:18). As we venture out to the last circle we are looking at how we can make a difference in our society. This can be a very intimidating subject because our society represents such a large amount of people. Beyond the shear number of people is the understanding that much our society is resistant to any “difference” that God’s church offers. The approach is simple. Some of the very pieces of the foundation of our faith are key elements to our ability to make a difference in our society. Truth. Grace. Love. Hope.